Holyhead Mountain Mountain or HillHolyhead Mountain lies about 2 miles west of the town of Holyhead, and slopes steeply down to the Irish Sea on two sides. There is a late Roman watchtower, called Caer y T?r (Tower Fortress) on the east side of the hill. Holyhead Mountain also has an Iron Age Stone Circle settlement and the material for the Breakwater was quarried from the Mountain too. It is the first sight of land people have when travelling from Dublin to Holyhead. Holyhead Mountain is home to several rare species of flora including the spotted-rock rose that cling to the dry, rocky areas, hidden within the scrub along the sides of the path. This tiny plant with yellow and crimson-spotted petals, only flowers once, and drops its petals within a few hours, making it extremely difficult to find. Another species endemic to South Stack is the spatulate fleawort - found here and nowhere else on the planet. Holyhead Mountain lies about 2 miles west of the town of Holyhead, and slopes steeply down to the Irish Sea on two sides. There is a late Roman watchtower, called Caer y T?r (Tower Fortress) on the east side of the hill. Holyhead Mountain also has an Iron Age Stone Circle settlement and the material for the Breakwater was quarried from the Mountain too. It is the first sight of land people have when travelling from Dublin to Holyhead. Trinity House, an ornate stone magazine hut was used to store gunpowder for a large cannon that was once positioned on the cliff top. The cannon would fire warning shots to any passing ships venturing too close to the rocks but eventually it fell into the sea. It has since been recovered and is now on show at the Breakwater Country Park. 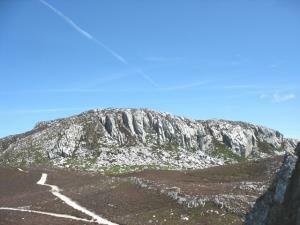 Holyhead Mountain can be accessed from Holyhead Breakwater Country Park (LL65 1YG). From the A55, take the A5154 for the town centre and follow the Country Park signs.